"My place is close to close to beaches, Old Town, Henderson Center, Hiking, Parks, great views, restaurants and dining. You’ll love my place because it is in a beautiful, private, quiet neighborhood overlooking the golf course, tucked into a green belt forest with a comfy bed, private bathroom, use of the kitchen and big private backyard"
It's "close to close beaches", must be pretty damn close, anyway ... Instant Book is a feature that allows you to enter your dates of travel and if a listing's calendar has no occupancy during that time, you can get an instant "confirmed" reservation instead of waiting for the owner to get back to you. 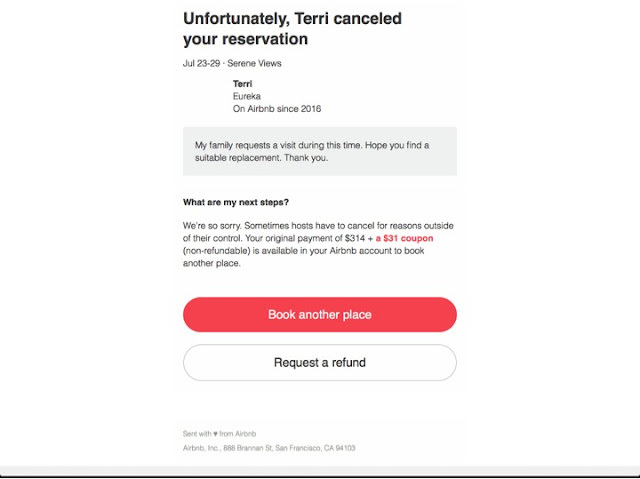 Sometimes it takes days to get a confirmed reservation from some of these ding-a-lings, so when I saw what looked like a nice place at a good price, I cancelled a reservation I had made on another site and booked with Eureka Terri ... BIG MISTAKE! "Looking forward to meeting you!" "My family requests a visit during this time. Hope you find a suitable replacement. Thank you." UNSAT ... FUBAR ... My week in Eureka is now Tango-Uniform and I am scrambling to find a place to stay for a week in my price range ... thanks, for nothing Terri and Airbnb! Now I'm going to have to pay hundreds of dollars more because some Airbnb Airhead, an unprofessional newbie, could not keep her calendar up-to-date. It makes Airbnb look bad because they condone this behavior and should not have been allowed. What is the purpose of Instant Book if your confirmed reservation can simply be cancelled on a whim by the host? 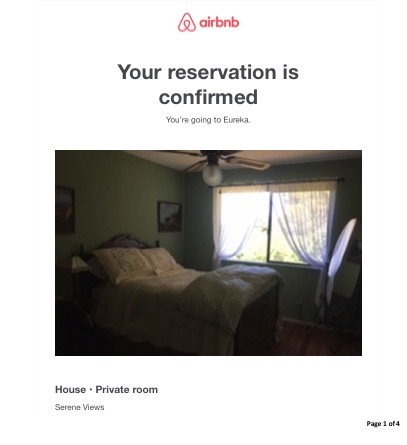 Useless ... both Instant Book and Airbnb's response to the situation because when I sent them a message communicating my dismay, all I got was an automated response telling me, to paraphrase: "we're too busy and important to respond to every customer ... sorry, you are on your own bub!" CombatCritic Gives Eureka Terri And Airbnb 1 Bomb Out Of 10 And A Spot On MY WALL OF SHAME ... More Bombs Are Better!